A man takes a new job on the 7th-and-a-half floor of an office building and stumbles upon a membranous room that leads inside the head of stage and screen actor John Malkovich. There he can see life through Malkovich's eyes before being systematically ejected from the room and onto the New Jersey turnpike. 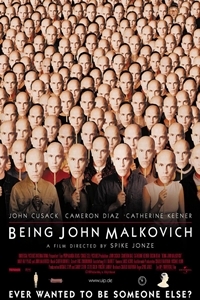 The man then rents out Malkovich's head to others, eventually letting his wife inside where she falls in love with another woman who, in turn, thinks she has fallen in love with John Malkovich.